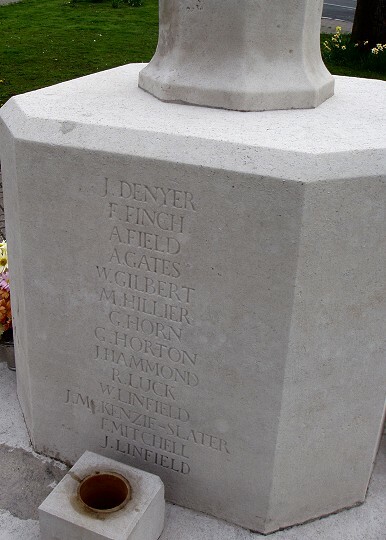 The Angmering War Memorial was designed and produced by Sussex stonemasons and unveiled on 27 May 1920. It is 14 feet high and is built of Portland stone. 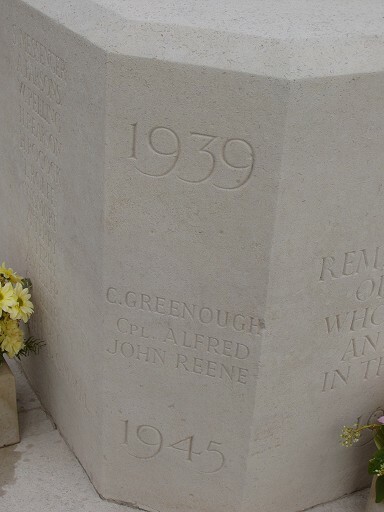 Standing on two octagonal steps, the Memorial comprises a cross and shaft combined on a tall chamfered plinth on which the names of the Fallen of both World Wars have been inscribed. It was produced at the Mr Francis Tate's Carrara Marble Works of 22 North Street, Worthing. Francis Tate's invoice for the production and errection of the cross was £194 6s 0d. 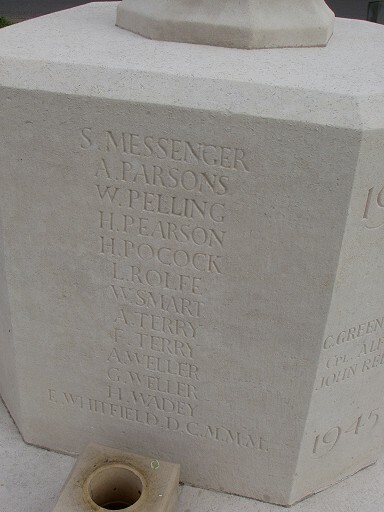 The Angmering firm Z. Peskett & Sons prepared the foundations for the Memorial at a cost of £10 5s 0d. In 1929, the ownership of the Memorial was taken over by Angmering Parish Council but the Royal British Legion was asked to care for the monument and its surrounds, a situation that exists to this day. The monument is maintained in very good condition and the Women's Section of the Royal British Legion place fresh flowers weekly on the memorial between April and November. 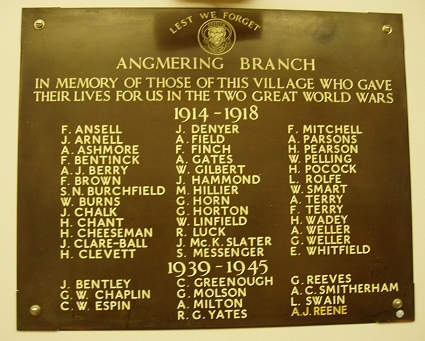 The Angmering war memorial committee set up in 1919 was more representative than in most other villages, particularly in Sussex. It comprised the two overseers of the poor, three representatives from the churches (C of E, RC, and Baptist), three representatives of friendly societies (Forester's Court, Equitable Society, and St Wilfrid's Slate Club), and two female relatives and one male relative of the Fallen. On the 24 June 2002, the Secretary of State, Department for Culture, Media and Sport, scheduled the Memorial as a Grade II structure under the "Planning (Listed Buildings and Conservation Areas) Act 1990 - Buildings of Special Architectural or Historic Interest". 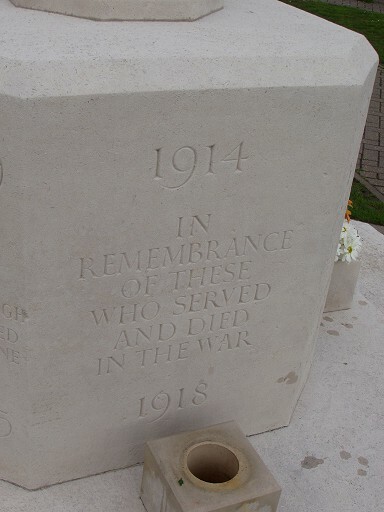 The lettering on the war memorial has been attributed to the renowned designer and sculptor, Eric Gill. 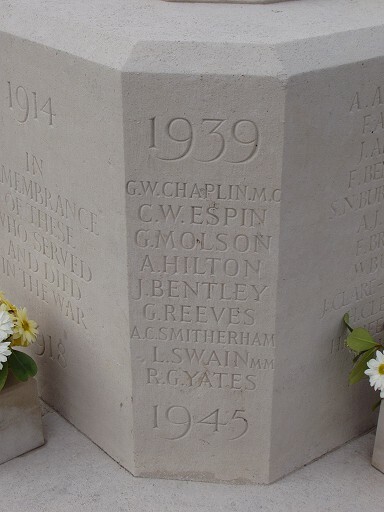 Gill was amongst the greatest designers and practitioners of letter cutting of his generation which makes Angmering's war memorial of historical importance. "In Remembrance of these who served and died in the war"
L/Cpl Alfred Lewis Ashmore 1st Worcester Regt. Pte Frank Bentinck 61st Machine Gun Corps. Dvr Archibald Field 256th Royal Field Artillery. Pte Frederick Finch Royal Army Vet. Corps. 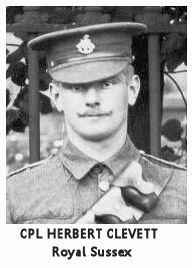 Sgt William Gilbert 4th Worcester Regt. 2nd Lieut Maurice Hillier 6th K.O.S.B. Rflm Robin Luck New Zealand Rifle Brigade. Pte Harry Pearson 1st Royal West Kent Regt. Pte William Smart 2nd K.O.Y.L.I. 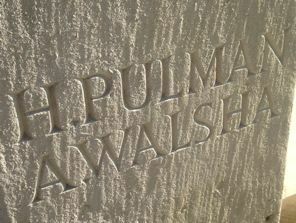 Lieut Albert Walsha 9th Norfolk Regt. Pte George Weller 1st East Surrey Regt. The Roll of Honour website at www.roll-of-honour.com provides information on those men and women who fell fighting for their country. 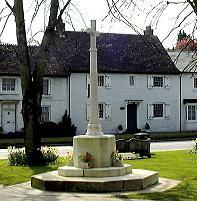 Click here to see the Angmering WW1 entries. 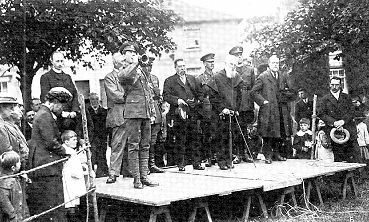 The unveiling of the War Memorial on the Village Green 27 May 1920. Colonel Walter Campion, who commanded a territorial battalion of the Royal Sussex Regiment. He was MP for Mid-Sussex in the years 1910-1924. Also in attendance was the Colonel's Adjutant, Captain Middleton. Pte Charles W Espin Royal Army Veterinary Corps. "On 4 Feb. 1944 at CARROCETO, No. 2 Coy which had been heavily attacked by infantry and tanks throughout the night, was completely cut off from the Bn and all communications had broken down. It was not possible to reach the company without going over about 200 yards of open ground in full view of the enemy whose machine guns invariably opened up on any observed movement. The Commanding Officer ordered Lt. Chaplin to go forward to see if it was possible to reach the Company. Disregarding the enemy fire, Lt. Chaplin made his way through heavy MG fire to the company, and personally visited all three platoons, encouraging the men and giving them information about the battle as a whole. This action greatly raised the morale of this company. Lt. Chaplin returned through enemy fire having obtained for the Commanding Officer detailed information about the night's action and the names and numbers of casualties. On the night of 7/8 Feb., BNHQs was in a gully - to which the enemy penetrated in strength having overrun three coys. The enemy took up positions on the top of the cliff which overlooked the HQ, and started firing at short range with machine-pistols, LMGs and hand-grenades into the Command Post. Lieut. Chaplin went out alone on his own initiative, climbed round the entrance to the gully and by throwing hand-grenages at the enemy kept them from the edge of the cliff for long enough for the Command Post to be moved. But for this gallant and spontaneous action the enemy would have been able from the cliff-top to drop grenades right into the Command Post and would have destroyed Bn.HQ." Not mentioned on the War Memorial is Harry Linfield (born c1881), son of Edwin and Caroline Linfield. On his parents gravestone in St Margaret's churchyard is an inscription which states that Harry (37) died in November 1918 while on duty with the Hong Kong Police. 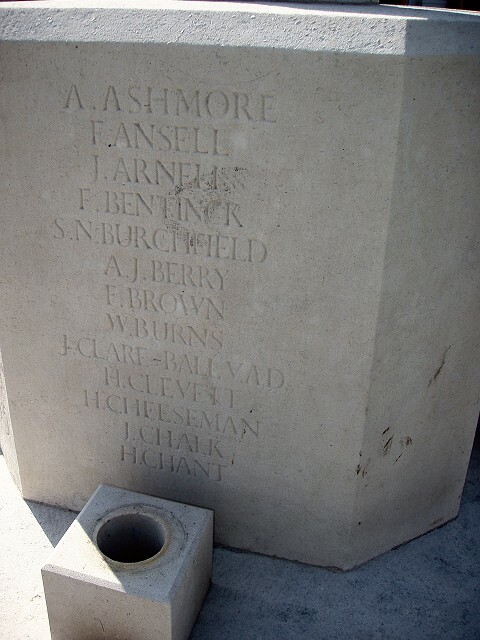 It is unclear why Francis Norbury's name was not included on the War Memorial if he came from Angmering or what his connection was with Angmering. What is known is that he was a captain in the 6th Bn. King's Royal Rifle Corps attached to the 1st Bn. He was the son of Mrs. E. T. Norbury, of The Lench House, Stratford-on-Avon, and the late Mr. T. W. Norbury. Educated at Oundle and St. John's College, Cambridge, he was a house-master at Oundle at outbreak of war. He was 32 at the time of his death. I would welcome any additions/amendments/photos to the foregoing list. See Contact page.